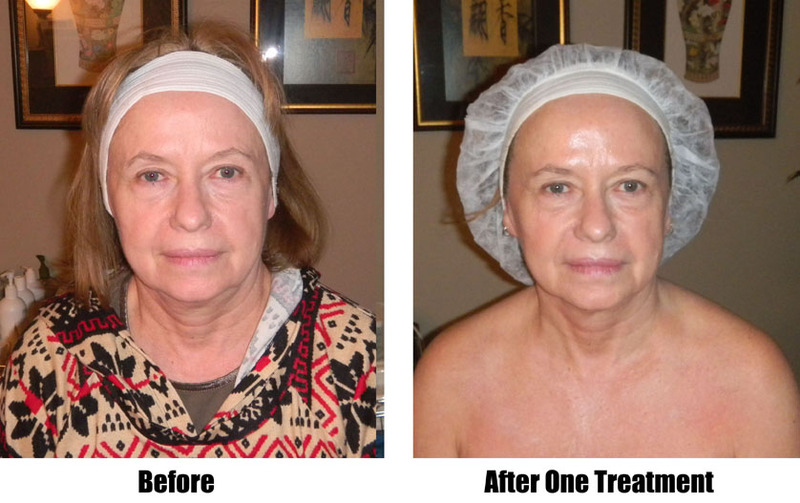 A Natural “ Face lift Lift” with NO Surgery! What is Beautiful Image Facial Rejuvenation? The Beautiful Image Facial procedure is a revolutionary way to safely, effectively and gently tighten and firm the skin. It is performed through exclusively designed conducting wands, which emit Micro-currents. The current penetrates through the layers of skin through specific acupuncture points thus causing increased production of collagen which smooth and soften lines and wrinkles of the face and body. NO Harmful Lasers! NO Redness! NO Swelling! NO Pain! NO Recovery Time! harmful side-effects, no wounding, no abrasion, no soreness, and no pain. How is the procedure done, How does it feel and How many treatments will I need? The experience is so wonderfully relaxing and euphoric, that you may find yourself drifting off to sleep. Specially formulated skin products are first applied over the targeted areas of the face. This is essential blend is used as a conductor to enhance the effectiveness of the wave form, penetrating deep into the skin as the wands gently glide over the treated areas. The number of procedures recommended is determined upon your age and skin condition. Most clients are able to see noticeable improvement after their very first visit. Ten treatments will achieve optimal results. Expect to turn back the clock on aging. You will achieve overall improved skin quality and a natural youthful appearance. The improvements can be quite dramatic with a series of treatments. Once you reach your desired results, there are preventative measures you can take in order to maintain your new found skin. Your lifestyle should include drinking plenty of water, proper diet and exercise, avoiding harmful UV rays and include a good skin care regimen. Monthly treatments are also recommended to enhance and maintain your youthful appearance. facials I continue to see more lasting improvements. Thanks again. I was able to see amazing results in my skin after the first treatment! It’s one of the most relaxing treatments I have ever had. Marguerite is dedicated to her clients and offers a number different types of facials. Thank you Marguerite, I look forward to my next visit with you!